For those of us who spend time in the cities, we get so bombarded with the never ending white noise of machinery and people in motion that we forget how to really listen, how to hear the “real” sounds of the world around us. Silence, just silence, is one of the most immediate impacts on first-time visitors to the African bush. Of course, as with all things in life, silence is a relative and variable quality and unless you are in a truly empty part of the world there is hardly ever a total lack of sound – the trick is to listen! The wonderful thing about our sense of hearing is that once you have “tuned in” to a particular sound, you will always hear it again, and every time you do, you wonder why on earth you hadn’t ever heard it before that “first time”? In particular, there are two “calls of the wild” that stir my emotions deeply when I hear them in the depths of the black African night or greeting the arrival of dawn after the long perilous hours of darkness. No matter how deep my sleep is, no matter how far and faint the call is, I am so tuned in that I instantly awake to listen and marvel. 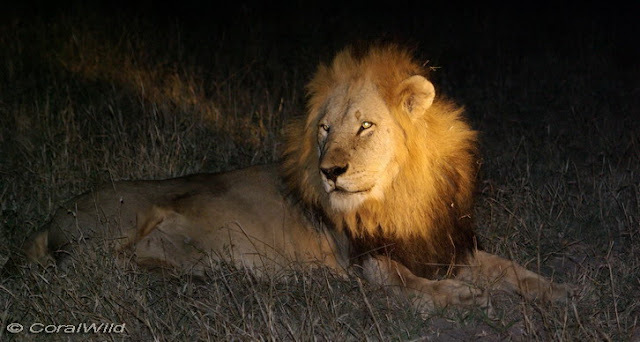 Much has been written, filmed, recorded and described about the “roar” of the African lion. But I can seriously say that until you have heard it yourself, out in the bush, you cannot truly appreciate the majesty of this awesome animal. To actually witness a lion whilst it is calling is an exceptional event. After all we are generally hiding safely in bed, like most sensible “prey”, when the lion is at its most active. For the few times that I have been fortunate enough to “be there” I have been deeply moved and had tears pricking my eyes on at least one occasion. Some of you reading these words right now have been there with me and you will know exactly where I am coming from. Moving on, reluctantly, from the lion’s call, I realise that I have digressed somewhat from the original intent of this posting, which was to share with you some thoughts on a distinctive bird that we are fortunate enough to see quite often in Kruger – the Southern ground hornbill. Apart from it’s unique looks, interesting habits and gorgeous eye lashes, it produces my most favourite bird call of them all. Early in the pre-dawn darkness is when I most often hear the booming, haunting melody of a parcel of ground hornbills, making their territorial calls, usually while still roosting in a favoured large tree. 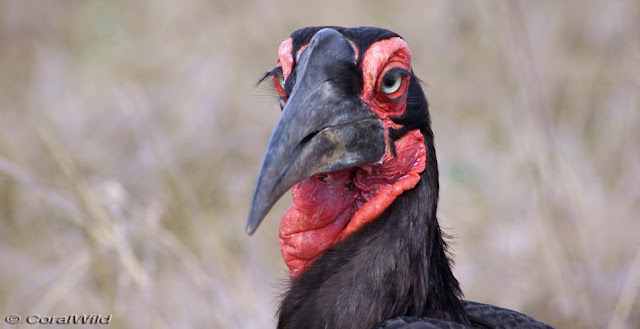 In pitch, the ground hornbills call is very close to that of a lion, a deep bass, just on the edge of human hearing, not easily picked up by the un-tuned ear, but still detectable through all the other higher pitched, every day sounds that are present as the camp wakes up for the new day. Nothing beats that wake up call for me, nothing. Sue, I love your writing. You never fail to transport me away from my office chair with your descriptions of nature! Thank you K. I've just read your blog for the first time and I love it. Another great read, Sue. Thank you. My most vivid memory of hearing lions was during a birding trip to the northern part of Kruger with Robert Weinand. We were having a very early picnic breakfast somewhere with a decided lack of fencing. Robert reassured us that the lions were 'a long way off' BUT I noticed that he didn't waste any time AT ALL packing away the equipment. It did make me wonder why because, unless Kruger lions have developed a certain sophistication, surely they wouldn't need cutlery, napkins, rusks and hot coffee to enjoy two plump (no longer!) and juicy (questionable!) Brits !! !